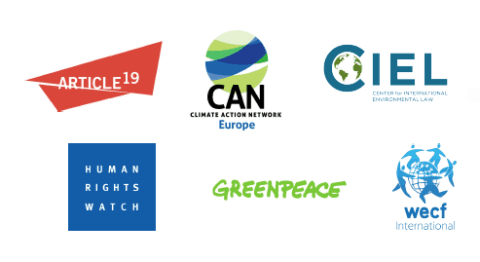 Open letter from ARTICLE 19, Human Rights Watch, Greenpeace and others to the Bureau of the Meeting of the Parties to the Aarhus Convention regarding concerns that Poland’s new law risks limiting public participation in the UN Climate Conference in Katowice, December 2018. The undersigned organizations wish to share with the Bureau of the Meeting of the Parties to the Aarhus Convention their concerns regarding a Polish law adopted last month that could have serious implications on Poland’s compliance with obligations under articles 3.7 and 3.8 of the Aarhus Convention concerning public participation in the context of the UN Climate Conference which will be hosted by Poland in December 2018. Poland offered to preside and to host the 24th Conference of the Parties to the UN Framework Convention on Climate Change (COP-24) and associated meetings related to the Kyoto Protocol and the Paris Climate Agreement from 3 to 14 December 2018 in Katowice. This conference is expected to adopt decisions of major importance in relation to the implementation of the Paris Agreement. In the UN climate negotiations process, governments hosting and presiding the annual Conferences of the Parties play a central role in determining the extent to which the effective participation of the public is promoted–both in relation to practical arrangements enabling the presence of the public and in defining opportunities for the public to access information and to participate effectively in the intergovernmental process. Last month, Poland adopted a “bill on specific solutions related to the organization of sessions of the Conference of the Parties to the United Nations Framework Convention on Climate Change in the Republic of Poland”. The lower house of the Parliament adopted this bill on 10th January and the bill was signed by the President on 29th January 2018 (the original copy of the bill is attached to this letter). The new bill contains two provisions of particular concern for the realization of the rights provided under the Aarhus Convention. Article 22 of the Polish bill prohibits any spontaneous demonstration in the city of Katowice from 26th November to 16th December 2018. This prohibition will impair the ability of members of the public to express their opinions as the negotiations develop rapidly and new issues emerge during the conference. The restriction is particularly damaging given the already limited opportunities for members of the public and representatives from civil society to participate effectively and provide inputs to the UNFCCC process. The undersigned organisations believe that this prohibition can threaten the realization of article 3.7 of the Aarhus Convention providing that “parties should promote the application of the principles of this Convention in international environmental decision-making processes and within the framework of international organizations in matters relating to the environment”. Additionally, article 17.1 of the bill allows the police to “collect (…) and use information, including personal data (…) about persons registered as participants of the COP24 Conference or cooperating with its organization – also without the knowledge and consent of the persons concerned by this data.” This systematic collection of information about participants of the COP-24 is of particular concern given the challenges environmental activists and community representatives are facing in many countries. Under article 3.8 of the Aarhus Convention Poland “shall ensure that persons exercising their rights in conformity with the provisions of this Convention shall not be penalized, persecuted or harassed in any way for their involvement”. While recognizing the importance for host countries to guarantee the security and safety of participants to international events, the scope of these provisions expands beyond this necessity and could impact negatively the effective participation of the public to the COP-24 as protected under the Aarhus Convention. The Parties to the Aarhus Convention have repeatedly recognized the particular importance of these obligations for the host of international environmental conferences and negotiations. The Meeting of the Parties to the Aarhus Convention has for instance invited the Secretariat and other Aarhus parties to provide technical assistance to the host country of major international environmental conferences (decision V/4, para. 5 and 7 and VI/4, para. 4 and 7). As a party to the Aarhus Convention, Poland should refrain from implementing any policies or measures that would interfere with the exercise of civil and political rights by members of the public in relation to the COP-24. In addition it should take adequate steps to ensure that the principles of the Aarhus Convention are promoted in relation to this event, and in line with the Almaty Guidelines on Public Participation in International Forums (decision II/4). The parties to the Aarhus Convention have recognised repeatedly that ensuring public participation in international forums is a crucial element to guarantee the effectiveness and adequacy of the decisions adopted by these intergovernmental processes. Additionally, at a time when the principles of environmental democracy are under assault in many regions of the world, limitations of freedom of assembly and the right to privacy during an international conference hosted and presided by a party to the Aarhus Convention would set a dangerous precedent and undermine the principles that the Aarhus parties seek to promote. The degree to which public participation is effectively respected and promoted in relation to the COP-24 will depend to a large extent on logistical arrangements and regulatory frameworks that are yet to be established by the Polish national and local authorities. Consequently, we call on other Aarhus Parties and the Bureau to the Aarhus Convention to urgently raise their concerns with the government of Poland at this early stage of the preparatory process to ensure that the Polish authorities can consider the importance of meeting their obligations under the Aarhus Convention in relation to the COP-24. its obligations under the Aarhus Convention as a host country of the COP-24. As representatives from all parties to the UNFCCC will convene in Katowice in December 2018, all of the Aarhus parties have the responsibility to ensure that this important event hosted by a party to the Aarhus Convention builds upon and promote the principles of the Convention. We remain at your disposal if you wish any additional information.